Critics of war memoirs have been slow to accept the reliability of soldiers’ accounts as adding anything objective to historical knowledge because it is argued that the individual who took part in warfare has had their memory subjectively scarred by the nightmarish horrors that they endured. Indeed, in With the Old Breed, E.B. Sledge described his experiences in the battles of Peleliu and Okinawa as akin to nightmares; which is something that may seem to give credit to the critique that war memoirs are entirely subjective in nature. However, Victor Davis Hanson, in his introduction to With the Old Breed, asserts contrarily that Sledge had a peculiar style of language, telling his story “…in a prose that is dignified” and not “given to easy revelations of his own strong passions. John Keegan, Paul Fussel, and Studs Turkel have all praised Sledge’s honesty…”. Aside from this and Lieutenant Colonel John A. Crown’s forward, the proof of Sledge’s writing’s worth as a historical source can be found nowhere else but in the pages of With the Old Breed itself. Sledge’s memory to the reader seems remarkable in spite of the ferociousness the Marines experienced in the Pacific Theater, which he credited to his extensive notes at the time, and using other historical references as his own sources. In the sixth chapter of the memoir, entitled “Brave Men Lost”, Sledge made one of many assertions of his distinct memory, but perhaps most explicitly. Referring to his usage of the word nightmare, Sledge inferred that the word evoked objectivity by paralleling his memories with the clearness that one finds in recalling the details of a long horrific dream when waking up the next morning. In the same paragraph, Sledge makes it known to the reader that what he did not know, such as specific locations (since only officers had maps) and passages of time (something all soldiers experiencing the drudgery of monotonous modern combat experienced) he left out all together. These factual trivialities were deemed not important anyway, partly because classical historical texts do that job already by giving names, places, and dates of events. In Sledge’s perspective, memoirs like With the Old Breed should not attempt to give their readers this kind of information, since their object is to put a human face, a relatable story, to the casualty figures shown in history textbooks. Sledge recognized that doing otherwise would be redundant and superfluous. The question of how memoirs such as Sledge’s can be considered a reliable historical source does not lie in the argument between subjectivity and objectivity then, but in acknowledging that a soldier’s memoir is historical literature. This is in contrast to factual history textbooks- in other words; memoirs are a different facet of historical analysis. Samuel Hynes summarizes the reasoning behind telling this kind of history when he exclaimed in the prologue of The Soldiers’ Tale,“That is what I have aimed to do in this book: to bring modern war down to the human realm, to give names and faces and feelings to the anonymous armies and so to discover what it was really like to be there…”. With the Old Breed is a perfect example of this, because Sledge really was there on the beaches and ridges of Peleliu and Okinawa, and thus had the opportunity to stem the tide of depersonalization that classical historical analysis creates in consuming the individual’s story of history with abstract, colossal numbers. With the claim of memoir legitimacy as a historical source put to rest, there is still a question of reliability when it comes to objectively expressing the subjective side of modern warfare. A salient representation of Sledge’s attempt to be as objective as possible could be seen in his recollection of atrocities committed by other marines. Sledge did not try to justify their actions under the pretext of war-related stress, but instead philosophically questioned how seemingly good-natured men became so brutal. In Okinawa there was an elderly civilian woman fatally wounded from shell-fire who begged Sledge to put her out of her misery, he refused and called a corpsman, but it was too late, while Sledge was finding help for the Okinawan native, another Marine quickly obliged her wishes, and then, “…emerged nonchalantly from the hut…” saying, “…just an old gook woman who wanted me to put her out of her misery”. When Sledge and an NCO reprimanded him, the Marine blushed from embarrassment; the author reflected upon this by stating “That quiet, neat, mild-mannered young man just wasn’t the type to kill a civilian in cold blood” –and yet he did. Even though Sledge did not attempt to give an answer to why such a horrific thing happened, it is important that he raised the question, because as John Keegan puts it, most historians think that situations such as the one mentioned by Sledge on Okinawa “need not be mentioned or can be glossed over by some reference to the ‘uncivilized behavior of small groups of soldiers’…”. Sledge indeed gave a straightforward analysis of the ferocity he and the Marines of the 1st Division faced. This, along with his admittance to not fabricating quotes even when what was said was important (although perhaps such a fabrication would be beneficial to the reader’s pleasure and sell more copies of his memoir) gave credence to the assertion that Sledge only desired to be as honest as possible. E.B. Sledge’s apparent integrity, along with his use of historical references, is proof enough that With the Old Breed is an objectively written subjective view of war that should be considered a reliable historical source. Sledge, E. B. Introduction. With the Old Breed: At Pelelui and Okinawa. London: Ebury, 2010. Sledge, E. B. With the Old Breed: At Pelelui and Okinawa. London: Ebury, 2010. Hynes, Samuel Lynn. The Soldiers’ Tale: Bearing Witness to Modern War. New York, N.Y., U.S.A.: A. Lane, 1997. Keegan, John. The Face of Battle. New York: Viking, 1976. Print. Millett, Allan Reed., and Peter Maslowski. For the Common Defense: A Military History of the United States of America. New York: Free, 1984. Print. 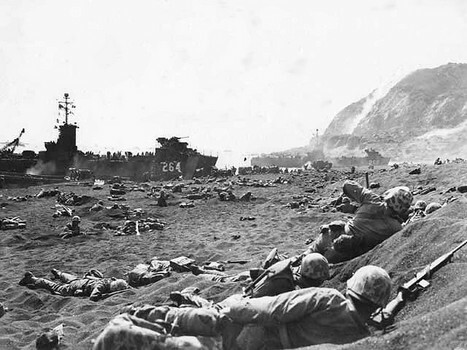 The 1st Marines Land on the beaches of Peleliu- now part of the island nation of Palau, in 1944 it was occupied by thousands of battle-hardened Japanese soldiers. Interesting subjective perspective of the finely tuned American amphibious tactics and the recently adopted defensive posture of the Japanese Imperial troops. I highly suggest reading the memoir if you haven’t already, the author is represented fictionally in the HBO series called The Pacific. Superb post. Personally, I would take the word of soldiers as truth, both sides, as ‘historical’ truth is often written by the victors and tends to be biased. A good example is Das Boot: by the end of the story you feel for the u-boat soldiers because its about humanity not politics. Haven’t digested Das Boot, otherwise I’d be able to respond accordingly. Thanks for the reply and recommendation. I know my Grandad was “subjectively scarred” from his career. War makes mad dogs of even good men, it’s a nightmare to witness. A heartbreak. I’ve always wondered if soldiers’ accounts weren’t accepted as serious — however subjective — historical accounts for fear it would rub the ‘shine’ off victories, illustrate the real costs were the realities boldly stated? Victory juxtaposed against such horrific penance is no real victory at all. Yes I’ve experienced the heartbreaking situation of listening to a WW2 vet tell his story as well. The enlisted man’s view is too often bypassed for the calculating big picture when it comes to history. For the Marines, victory with horrific penance is the best kind of victory, but I think that is what sets them apart from the other services- they revel in being thrown into daunting, horrific situations, as a whole I mean. The individual Marine is as human as the next man, which Sledge proves in his memoir. They just go through such rigorous training which allows them to endure better than other soldiers. Small world, hey? Like, what were the odds of them meeting? I don’t know much about the Marines. That was a really interesting bit.